These stuffed mushrooms with goat cheese are my go-to appetizers for almost every party. Nothing makes your home smell more divine than a few of these baking in the oven. They’re made with only 6 ingredients: mushrooms, garlic, butter, Italian breadcrumbs, garlic powder and tasty herbed goat cheese. My grandmother would make these all throughout my childhood, and I remember being so excited to grow up and make them myself. I’ve had so many different kinds, and nothing beats these simple, garlic and goat cheese appetizers. It’s always funny to watch what happens when there’s only one of these left on the plate. No one wants to be the one who takes the last one, but they also really, really want to be the one to take the last one. 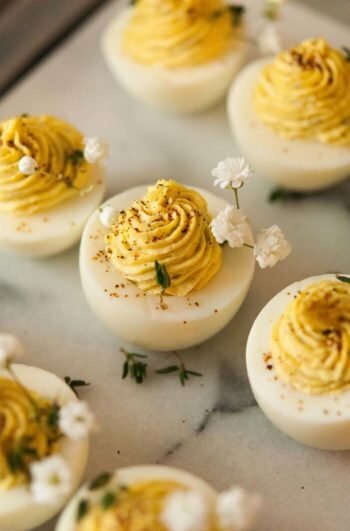 I made these for my Baby’s Breath-inspired dinner party recently. 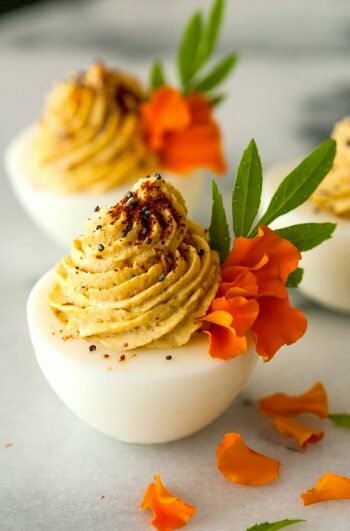 I served them with dill and thyme deviled eggs and a beautiful garden-inspired cheese tray. Enjoy these tasty stuffed mushrooms, and here are a few more for your next party! Nothing makes your home smell more divine than a few of these baking in the oven. This recipe requires a small sauce pan, food processor and foil-lined baking tray. Pre-heat your over to 375. Separate the mushroom stems from the caps and place the caps in a mixing bowl. Keep the stems. Place 8 garlic cloves and mushroom stems in a food processor and chop them together into tiny little rice-sized bits. Be careful not to chop them so much that they become mush. Set aside. Melt a tbsp. of butter with few shakes of garlic powder in a sauce pan or microwave. Pour the melted butter mixture over the mushroom caps. Coat them thoroughly, gently mixing. Remove and place them in a foil-lined baking tray. Add 2 tbsp. of butter to the sauce pan with the garlic/chopped stem mixture and cook until brown, between 5-10 minutes. Depending on how big your stems and garlic cloves are, you may need to add more or less butter. Just make sure the garlic/mushrooms are fully coated. Once brown, add the rest of the butter with 2 tbsp. of breadcrumbs and 1 tsp. of garlic powder. Mix together to make a nice stuffing. Again, depending on the size of your stems and garlic, you may need to add a little more or less breadcrumbs and garlic powder to create a nice, thick stuffing. Remove from heat once incorporated, and add a tiny bit of herbed goat cheese to your mushroom caps. Spoon your stuffing generously on top of the cheese into each cap.